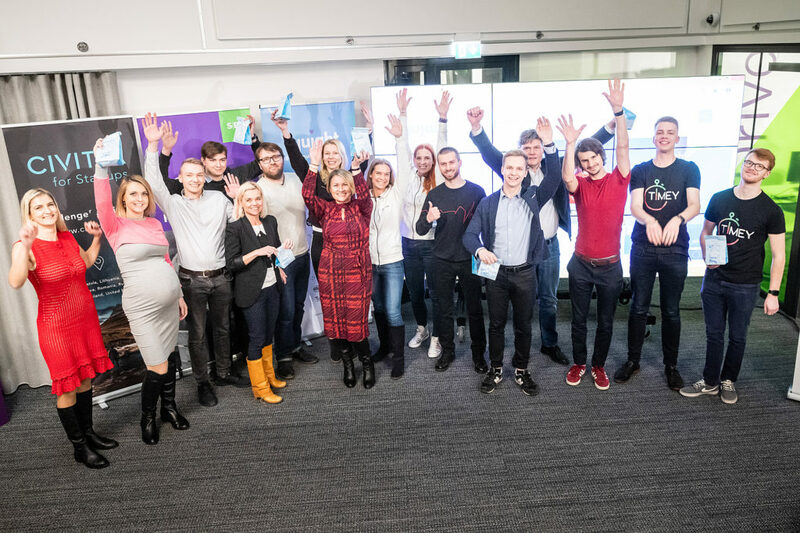 On 17th of March, ten of the best business ideas submitted to Estonia`s largest business idea competition “Ajujaht” were selected at SEB Innovation Centre. The TOP10 will continue to the next round of the competition. The ten best business ideas were the edible cutlery development company Edible, tooth protection gel Frenzy, home events` app GoInvite, Groveneerproducing stick-on wood panels, children`s transportation platform HopKid, drone positioning and navigation platform HIVE, boardgame for the visually impaired ALU, rental market background checking service SecureBadger, adhesive “best before“ indicator Timey and consultation service Võõras Sõber. According to Ajujaht initiator, Enterprise Estonia`s Chairman of Supervisory Board Erki Mölder, the TOP 10 teams exemplify Estonians` entrepreneurial spirit. “A number of people with previous experience in banking and insurance made it to the next round with their teams. They have decided to make a career change, which is something Ajujaht favours. It also shone through in their business ideas, which made the team and idea as a whole much more mature,“ said Mölder. SEB Head of Innovation Mart Maasik said that what proved decisive in making it to the next round, was how convincing the teams were. “Compared to previous years, we saw fewer lofty ideas and more realistic, already functioning solutions among this year`s Ajujaht teams that participated in the development programme. The teams that made it to the next round, have the balance between ambition and perception of business risks necessary to be successful in business,“ said Maasik and added that independent of how the competition goes, the probability to see these products and services on the market is very high. Elisa Managing Director Sami Seppänen`s recommends that all teams should work on simplifying their business idea and setting priorities. “First and foremost, the teams need to find answers to the questions the jury asked them. Then, everyone needs to set their priorities. The simpler and more concrete the business idea explanations and vision, the greater the probability of being successful at Ajujaht and elsewhere,“ said Seppänen. The best business ideas were chosen by a jury composed of Erki Mölder (Enterprise Estonia), Mart Maasik (SEB), Sami Seppänen (Elisa), Heidi Kakko (BaltCap Growth Fund), Kaidi Ruusalepp and Monika Tooming-Varblane (Funderbeam), Ott Jalakas (Lingvist). Ajujaht television programme will be aired on TV3 from April 04 on Thursdays at 20.00. The season`s winner will be announced on May 23rdon TV3 live programme. Ajujaht is Estonia`s largest business idea competition. Ajujaht was initiated by Enterprise Estonia, partner SEB and main sponsor Elisa. In addition, Ajujaht supporters include Law Office Triniti, Funderbeam, Lingvist, Estonian Employers` Confederation, Estonian Chamber of Agriculture, Harku Municipality, City of Pärnu, Saue Municipality, City of Tallinn, City of Tartu. Ajujaht is funded by Enterprise Estonia European Regional Development Fund. Ajujaht is carried out by Civitta Eesti AS, Kommunikatsioonibüroo JLP and Tehnopol.